Love a spicy potato soup that’s also loaded with creamy cheddar? Then this recipe is guaranteed to be a winner, as it has not just one, but two kinds of spicy peppers - poblano chilies and jalapeno peppers. And that’s not all! 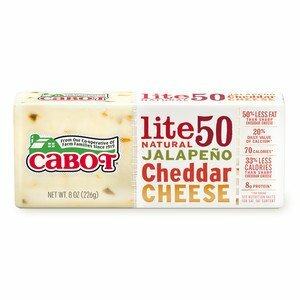 It also uses two kinds of Cabot cheddar – Jalapeno Lite50 Cheddar and Sharp Lite50 Cheddar. The combination of these two peppers and two cheddars result in a thick, hearty cheddar potato soup with just the right amount of heat and tang. Top each serving with crumbled bacon for even more of that loaded potato flavor! 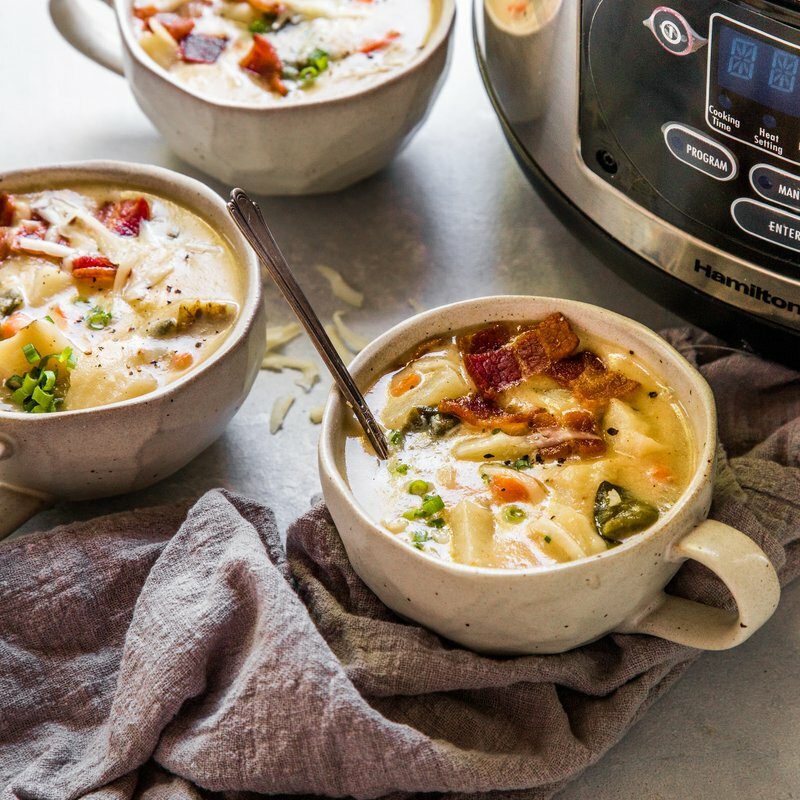 After you make this soup, please feel free to share the recipe with family and friends on Facebook, Pinterest, Instagram, and Twitter! To make, cook the bacon in a large pot until crisp. Transfer bacon to a paper towel to drain and set aside. Discard all but 1 tablespoon of fat from the pot. Add carrots, poblanos, onion, jalapenos, garlic, and cumin and sauté until golden brown. Then add in potatoes, chicken broth, and salt and bring to a boil. Reduce heat to maintain a gentle simmer, cover pot, and cook for about 25 minutes, or until potatoes are tender. In the meantime, gradually whisk milk into flour in a bowl. Once the milk and flour mixture is smooth, slowly whisk it into soup. Cook over medium heat, stirring occasionally, until soup is thickened. Remove pot from heat and add cheeses, stirring until melted. Crumble bacon, ladle soup into bowls, and top each bowl of soup with crumbled bacon and chopped green onions. 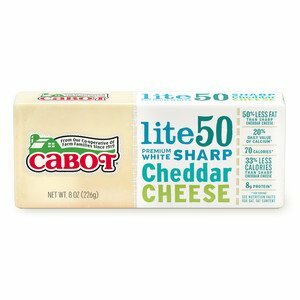 As a cooperative of 800 farm families, Cabot takes a lot of pride in making our award-winning dairy products. We’d love to hear your thoughts on this spicy potato soup, so please rate and review the recipe once you’ve made it. COOK bacon until crisp in a large pot. Transfer to paper towel and set aside. Discard all but 1 tablespoon fat from pot. ADD carrots, poblanos, onion, jalapenos, garlic and cumin; sauté until golden brown. Add potatoes, chicken broth and salt. Bring to boil. Reduce heat to maintain gentle simmer, cover pot and cook for 25 minutes, or until potatoes are tender. WHISK milk into flour until mixture is smooth. Slowly whisk milk mixture into soup. Cook over medium heat, stirring occasionally, until soup is thickened, about 12 minutes. Recipe courtesy of Shannon Justice of Chetopa, KS. Been making this for years. From Cooking light. Best soup ever. I won a soup contest with this recipe! Made on stove not crock pot. This is the best potoato soup I have ever made or tasted. My family loved it too! Awesome recipe! My family loved it, "Just right Spicy"